2017: My student, Xiaofan Zhang, successfully passed her dissertation defense, and will join the JD Silicon Valley Research (JingDong). 09/2016: Received an NSF grant (II-New: Collaborative: A Mixed Reality Environment for Enabling Everywhere Data-Centric Work, with Dr. Aidong Lu); and a funded project in NSF-I/UCRC. 03/2016: Two papers accepted by CVPR'16, focusing on fine-grained image categorization. 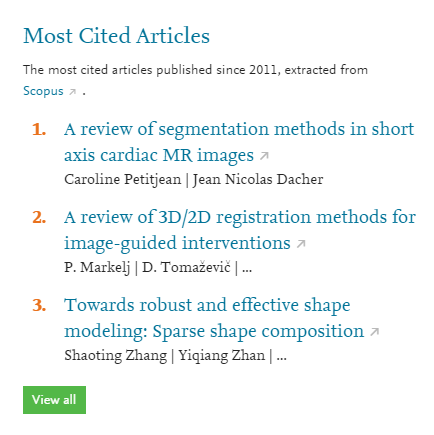 01/2016: Three co-authored papers are among the most cited articles published in Medical Image Analysis since 2011, including the sparse shape composition among top three. 01/2016: Received my teaching evaluation for Fall 2015. Overall I got 4.57 for Algorithms and 4.78 for Computer Graphics (dept. average ~4.0). Here is the Quantitative and Qualitative Summary. 01/2016: Several journal papers to appear in TPAMI (congrats to Xiang! ), MedIA and JBHI (Xiaofan!). 10/2015: Congrats to Menglin (my co-supervised student) who received the MICCAI'15 Young Scientist Award (4 out of 810), for our work on the image-guided diagnosis of intraductal breast lesions. 08/2015: In this summer I visited the Media Analytics Department at NEC Labs America, working with a group of excellent researchers on fine-grained image categorization. 08/2015: Three papers accepted by MICCAI 2015, including two orals (~4% acceptance rate). 03/2015: We released the mammogram dataset for image retrieval. Details in our TBME paper. 03/2015: I accepted the invitation to serve as the associate editor of Neurocomputing. 03/2015: Congrats to Xiaofan for her papers accepted by ISBI'15 (among 18 finalists of the Best Student Paper), CVPR'15 and IPMI'15! 10/2014: I will serve as the area chair of ISBI'15, and session co-chair on imaging cellular processes. 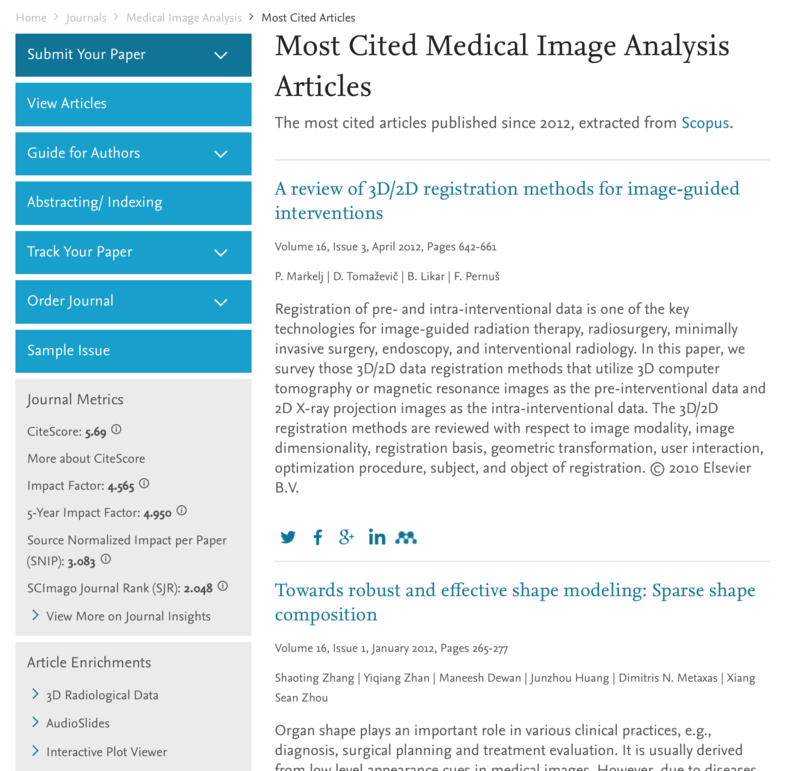 09/2014: Several journal papers to appear in TPAMI (large-scale image retrieval and feature matching), TMI (hashing medical images and low-dose CT perfusion), TBME (mammogram retrieval), MedIA (sparse deformable models and fast SSC). 08/2014: I will be the guest co-editor of a special issue in Computerized Medical Imaging and Graphics, on the topics of Sparsity Techniques in Medical Imaging. 07/2014: I am co-organizing two MICCAI workshops this year: Sparsity Techniques in Medical Imaging (keynote speakers: Dr. Yoram Bresler and Dr. Daniel Rueckert) and Medical Computer Vision: Algorithms for Big Data (keynote speakers: Dr. Xiang Zhou and Erik G. Learned-Miller). 05/2014: I received the 2014 Ralph E. Powe Junior Faculty Enhancement Award from Oak Ridge Associated Universities (two nominations from each institute, 35 awardees out of 134 applicants). 04/2014: Two papers accepted by MICCAI (early acceptance). Congrats to Xiaofan and Yan! 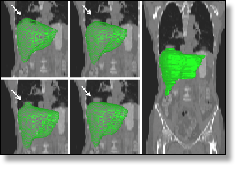 04/2014: Our paper on mining histopathological images via hashing won the Best Paper Travel Award in ISBI 2014 (3 awardees out of ~600 submissions). Congrats to Xiaofan! This is the project page. 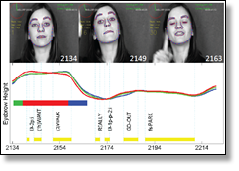 02/2014: Our FG paper on American Sign Language Recognition was selected and accepted by the IVC special issue on Best of Automatic Face and Gesture Recognition 2013. 10/2013: This is the Matlab code of our Sparse Shape Composition, with very efficient solvers (i.e., much faster than our Python code using different solvers). Thanks to Guotai Wang for preparing this! 10/2013: This is the project page of our ICCV'13 paper on face tracking. Code is also released. 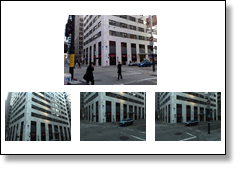 08/2013: We released Python code for our ECCV paper on large scale image retrieval [project page]. 04/2013: We organized a special session on sparsity in ISBI'13 (San Francisco). I gave a talk about our sparse deformable models (an abstract in ISBI, a full paper in IPMI'13). Also thanks to Dr. Dinggang Shen, Dr. Li Wang, Dr. Yan Zhou, and Dr. Tsuhan Chen for their contributions and great talks. 03/2013: We visited the National Space Biomedical Research Institute (NSBRI) and showed our real-time demo (face tracking + expression recognition) to NASA people, including two astronauts. We received one-year grant and will install our system in NASA Johnson Space Center this year. 03/2013: I gave a talk in the workshop of CDDA at Stony Brook (The Center for Dynamic Data Analytics, NSF-I/UCRC, between Rutgers and Stony Brook). We got two grants on medical imaging projects (GE Global Research and BioClinica). Also kudos to Zhennan for his best poster award. 02/2013: Two papers accepted by IPMI'13. Kudos to Mingchen Gao (Segmenting Papillary Muscles and Trabeculae) and Yang Yu (Sparse Deformable Models with Application to Cardiac Motion Analysis). 11/2012: An oral presentation in FG'13 on American Sign Language recognition. Congrats to Jingjing Liu and Bo Liu. This is a collaboration with Carol Neidle's group in Boston University. 09/2012: Co-organized the Fall 2012 Workshop of Center for Dynamic Data Analytics (CDDA). My proposed research project on medical image segmentation received top one evaluation from our industrial partnerships and also got a grant from BioClinica ($35K per year). 06/2012: Two papers accepted by ECCV'12, and two by MICCAI'12. Kudos to Xinyi (Background subtraction using group sparsity and low-rank constraint) and Mingchen. 10/2011: Passed my PhD dissertation defense. Thanks to my committee members: Dimitris Metaxas, Vladimir Pavlovic, Tina Eliassi-Rad, and Ron Kikinis. 09/2011: Our paper Deformable Segmentation via Sparse Shape Representation was selected as the MICCAI'11 Young Scientist Award Finalist. The Python code was released. 10/2010: Our paper Efficient MR Image Reconstruction for Compressed MR Imaging won the MICCAI'10 Young Scientist Award. The Matlab code was released. 06/2010: Presented our oral paper Automatic Image Annotation Using Group Sparsity at CVPR'10. The Matlab code was released. 05/2010: Presented our oral paper Skeleton Based As-Rigid-As-Possible Volume Modeling at Eurographics 2010. The C++ code was released, which includes mesh editing and geometry processing. 06/2009: Presented our paper LV Surface Reconstruction from Sparse tMRI using Laplacian Surface Deformation and Optimization at ISBI 2009. The C++ code was released. Dr. Shaoting Zhang is an Assistant Professor in the Department of Computer Science at the University of North Carolina at Charlotte, since 2013. Before joining UNC Charlotte, he was a Research Assistant Professor in the Department of Computer Science at Rutgers-New Brunswick, 2012-2013. He received PhD in Computer Science from Rutgers in 01/2012, M.S. from Shanghai Jiao Tong University in 2007, and B.E. from Zhejiang University in 2005. Dr. Zhang's research is on the interface of medical imaging informatics, computer vision and machine learning. His work related to robust and large-scale medical image analytics has earned several awards, including the Young Scientist Award in MICCAI 2010 and its finalist in MICCAI 2011, one of the most cited articles in Medical Image Analysis, and the 2014 Ralph E. Powe Junior Faculty Enhancement Award from Oak Ridge Associated Universities. More importantly, Dr. Zhang has been (co)advising amazing students, who have received the Best Paper Travel Award in ISBI 2014 (3 out of 600) and its finalist in ISBI 2015, by Xiaofan Zhang; the Young Scientist Award in MICCAI 2015 (4 out of 810), by Menglin Jiang; and the Front Cover Article in Medical Physics, May 2013, by Guotai Wang. Dr. Zhang's research has been funded by NSF (ABI, CRI-II, I/UCRC), ORAU, and industry collaborators (e.g., NEC Lab). He is on the editorial board of Neurocomputing, a guest editor of CMIG, and a senior member of the IEEE.